In light of October being Breast Cancer Awareness Month, there are some facts that should be considered in regards to Obamacare. During a press conference, Obama made reference that “The Affordable Healthcare Act could save the lives of cancer patients.” After careful evaluation of the Affordable Healthcare Act schedules, a person could reasonably conclude that his statement was misleading to Americans. With so many politicians involved with Obamacare, it is no wonder why the public is hesitant to trust in anything that comes from the White House; and with very good reason. If the public feels Obama and his staff have not been forth coming in regards to Obamacare, the public would be correct in that assumption. Ocala Post didn’t have to dig very deep to find serious flaws in the Affordable Care Act. Citizens might ask themselves why they have not heard anything from insurance agencies, or why haven’t they been on the news? It’s because the insurance agencies are on the payroll list. The team at Ocala Post has spent the past week in meetings with medical insurance billing companies and sitting down with individual doctors in order to get the hard facts of Obamacare from the inside; and finding out how it is already effecting citizens as well as medical offices. While Obama continues to point the finger at the republican party, the facts are clear cut. Let’s start off simple. What exactly is Obamacare and the Health Care Reform? On March 23, 2010, President Obama signed into law The Patient Protection and Affordable Care Act. The purpose of this law is to not only provide Americans with options to affordable healthcare but to improve, regulate, and reduce spending in healthcare. On October 1, 2013, the Health Insurance Marketplace went live to provide open enrollment for Americans to apply for and choose insurance plans that are federally regulated with subsidy assistance for those that qualify. The Affordable Care Act is literally over a thousand pages of reforms made to the current insurance industry. By reforming the current industry, healthcare costs will be reduced, thus making healthcare affordable. There are millions of Americans that are uninsured because they cannot afford coverage or don’t meet other qualification factors for Medicaid or Medicare. The Health Care Reform will solve this issue. By providing affordable and subsidized coverage, more Americans will become insured and receive healthcare that they may have not otherwise have. Additionally, the reform will expand Medicaid and Medicare to people who may have not qualified in the past. Open enrollment is October 1, 2013 to March 31, 2014. Plans will become effective January 1, 2014. Those are the facts! If you want to read about all the ins and outs of Obamacare, visit https://www.healthcare.gov/. We’re going to highlight The Good, The Bad, and the Ugly; basically what you SHOULD know but probably do not. If you think you have heard enough about the good and the bad of the Health Care Reform, then do yourself a favor and skip down to “The Ugly.” That is the scary part. eliminate pre-existing conditions and gender discrimination. ensures that quality insurance is available to everyone that is not able to obtain a policy through their employer. increases protection from being dropped from policies if you become sick, have met lifetime limits, or inability to pay your premium. expand Medicaid coverage to millions of uninsured Americans that may have not previously qualified. offers cost assistance (subsidized plans) to those that make less than 400 percent of the federal poverty level ($93,700 as a family or $43,021 as an individual in 2013) through tax credits. The subsidized plans will cost 0-9.5 percent of taxable income. allows children to stay on their parent’s current insurance plan until age 26 regardless if they are married, student status, or living arrangements. offers rebates back to you on the premiums you pay if the insurer under-spends. offers credits to businesses that provide policies to their employees. Obamacare requires that ALL Americans have health insurance either through a private provider or through a state or federally assisted program, If you do not have insurance in place , you must pay a tax equal to 1% of your income in 2014 and 2.5 percent in 2016. Obamacare requires that all employers with over 50 full time employees offer health insurance to their employees. If the employers choose not to comply, they will face a penalty. In this economy, many employers are already stretched far too thin. In order to avoid the penalty, many employers have decided to downsize their workforce or reduce employee hours so they are no longer required to provide benefits. In turn, this causes even more hardship on the employers and obviously the employees. The fear that the government is controlling the Americans by forcing them into purchasing health insurance; therefore indirectly violating their constitutional rights. A Government website recording ALL of Americans indentifying information; even though claims have been made that citizens do not have to input personal information. A claim in which Governor Rick Scott of Florida says is completely false because personal information is being required. Immediate doctor shortage with lower reimbursement rates therefore creating a lower quality in care. Even with subsidized assistance, the financial strain will be too great for many Americans that already struggle to feed their families or put gas in their cars without having to pay an insurance premium. Americans that wish to purchase a private insurance policy may, but if it is determined they qualify for Medicaid according to the income guidelines they will be forced to carry Medicaid. Ultimately, this will create more taxes for American’s. Now that we’ve briefly highlighted the pros and cons from an economic and political standpoint, let’s touch on the issues that have not really been talked about. The issue that will directly impact each and every insured individual. While it is true that the reform will provide for no cost preventative and wellness services, it is not as clear cut as you might think. While it is true that the reform will cover preventative screening and wellness exams, what they have not told you is that there are schedules to follow. For example, it is typical for a sexually active woman to receive a pap smear every year until her doctor feels they are no longer necessary. The new standards under Obamacare will limit pap smears to once every THREE years for women ages 21-65. So, what happens if you are under 21 or over 65? Well, they aren’t covered because they are not recommended by the U.S. Preventive Services Task Force. While screening mammography for high risk women remains yearly, routine or low risk women mammography will be covered every two years. How does this offer “better” preventative care and better cancer screenings? Cervical and breast cancers are usually quite aggressive; however they can be manageable when caught and treated early. When it comes to cancer, days, weeks, and months mean the difference between life and death. Can you imagine what years do? 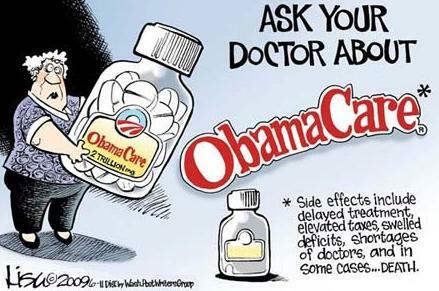 Another issue is healthcare rationing; something Obama denies time and time again. However rationing is an undeniable fact after reading the schedules on the governments own website. One view of rationing by many is the fact that it appears that as a person gets older, their benefits become limited as you can see from the recommended testing schedule above. Another view of rationing is the shortage of doctors and providers available for patient care. Look at it from this perspective. As part of the reform, reimbursement and allowable fees to doctors are being decreased. If the doctors insurance remittance amounts are decreased, the doctor will ultimately have to decrease their staff size. With the reform also comes more paperwork for doctors offices to complete for authorizations, referrals, and certifications and if not followed or submitted timely, the doctor will be penalized. In other words, you have taken a medical office that had to decrease their staff due to reimbursement rates but now there is more work for the office to complete on a reduced/limited staff. This will then limit the amount of patients a doctor can see in a day and furthermore, it will limit the amount of time a doctor actually spends with their patients. Underpaid and overworked doctors doesn’t make me feel too confident in their abilities to treat, diagnose, and manage my health or the health of a loved one. Another issue that many providers will face are the restrictions that Obamacare will put on the way they manage their patients. While a doctor feels it is in a patients best interest to have their blood checked every 6 months to manage or follow up on a condition, if the patients insurance no longer covers that frequency, the patient will most likely refuse the test; hence making it very difficult to effectively and safely manage that patients care. While there are certainly ways around the allowed frequency; such as appealing for medical necessity, who is going to do all the appealing when there is limited office staff in the doctor’s office? If citizens have not been involved, now would be a good time to contact congress and the President of the United States to express your concerns. We want to hear from you. How do you feel about Obamacare?